Oh, how I've missed being here on my blog! Life's been super-busy since I started my temp job at an accounting firm at the end of February, and I'm too tired most nights to go up to the craft studio. Good thing I've got posts pre-scheduled for times like these! Over the last several months, I've made so many cards that I now need to clump some of them together in one post. Here's a potluck mish-mash of things -- FOUR posts in ONE!! #1) You know how I feel about hydrangeas, don't you? Just one look at my blog header tells you I'm in love with them. 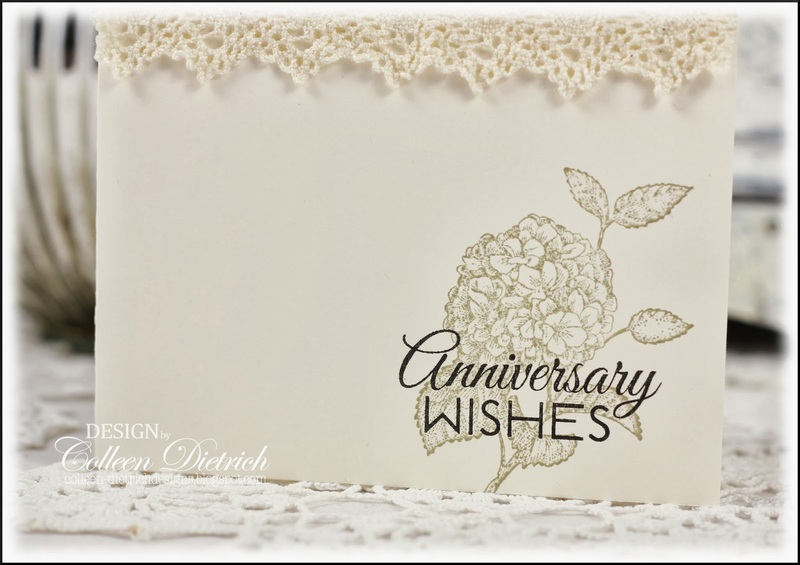 Monochromatic cards are so appealing to me, so I used only gray and white on this card (plus black for the sentiment - by Verve). The velvet gray ribbon is by May Arts. #2) This is definitely "freestyle collage" style, isn't it? I tried it on for size, the "put lots of stuff on a card" thing, and it did not feel very comfortable. Still, I thought I would share. The sentiment is from Spring Blossoms by Inspired By Stamping (after I cut off the exclamation point...I often do that 'cause it just seems weird to shout a sentiment to the card recipient). The postage stamps are from their Summer Postcard Add-On set. 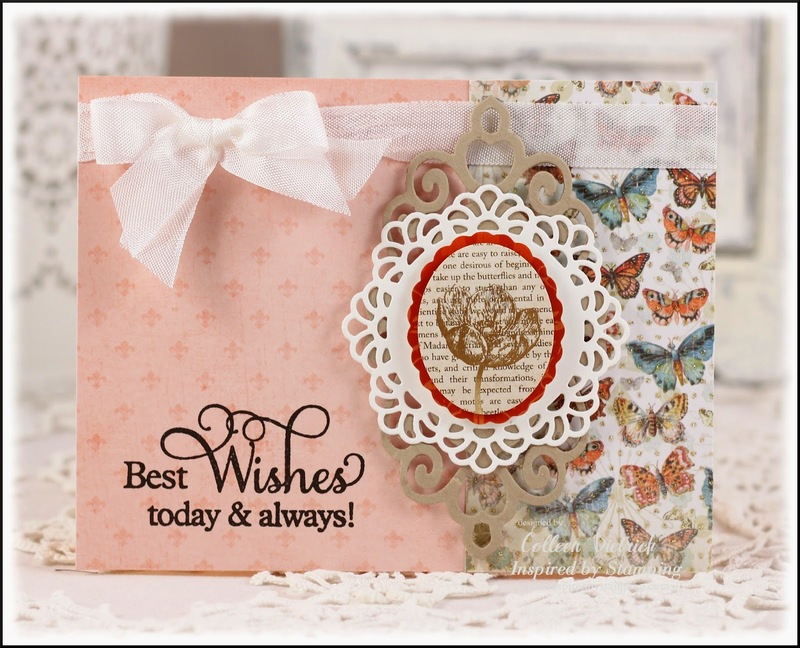 #3) You can tell I had the Mariposa Stack of papers by DCWV out on the same day I made cards #2 & 3. :-D This one could be used for all kinds of occasions, though I think I pegged it for a birthday card. 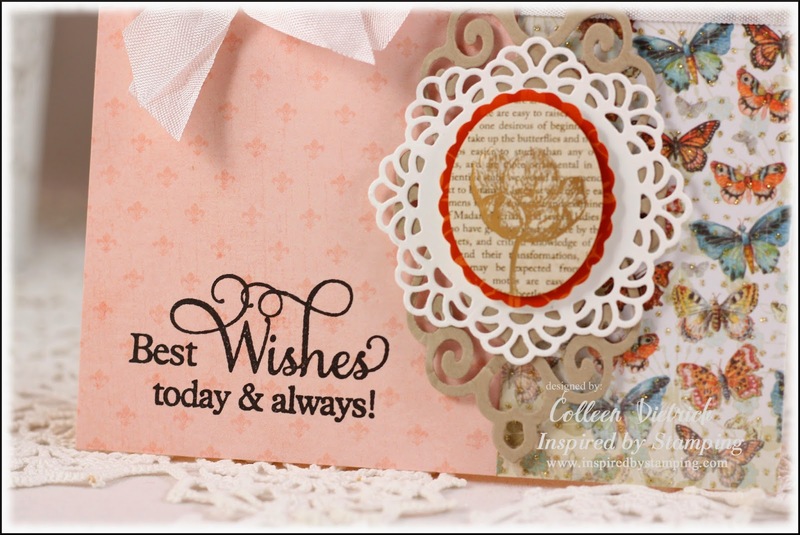 The sentiment is from Big Wishes II / Inspired By Stamping. The gilded tulip sticker is coordinates with the Mariposa Stack, found on clearance for pennies at JoAnn's. I matted it on a doily die cut, then a Fancy Tag die cut. 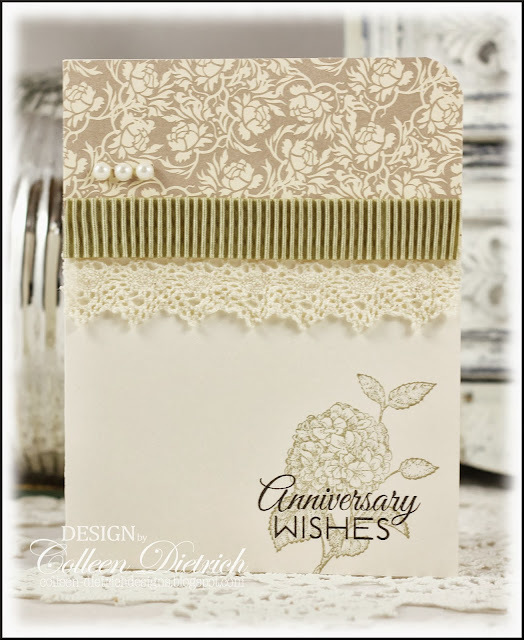 #4) And finally, I've got a simple anniversary card to share, using my fave flower once again. It's from one of the older Stampin' Up! sets, Abundant Joy. That's a set I will keep for a long time. Even though it hasn't been inked in forever, it holds images I think are lovely. The sentiment here is from Love Story / Verve, another set I find too valuable to part with. Happy sigh! Feels good to blog. I like it as much as I enjoy making the cards. I've got posts lined up for the coming week, and now it's time to do the laundry. Now, THAT is something I do NOT enjoy! Soooooooooo gorgeous! You are just amazing!!!!!! So beautiful! 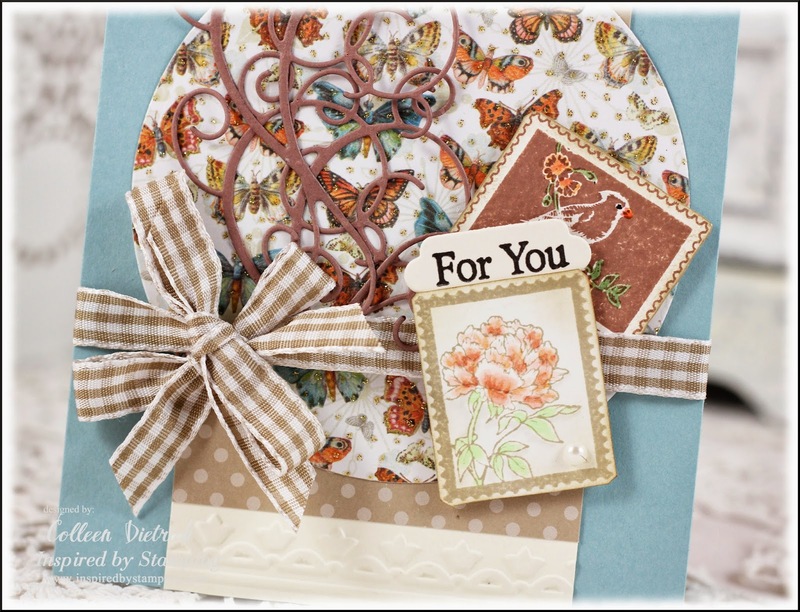 That sympathy card is just stunning in the mono color scheme! What GORGEOUS cards, Miss Lady!! Mmmmm, yummy potluck! It's amazing how work takes the creativity right out of you, isn't it? I don't want to hurry the years, but I can't wait to retire! So glad you had a chance to share these beautiful cards. Your potluck was much more delicious than the one we had at work on Friday! So pretty things here Colleen. I recognize some of my favorite papers here - lovely work! Hugz! Again, beautiful designs and cards. Love the hydrangea and glad I have it. 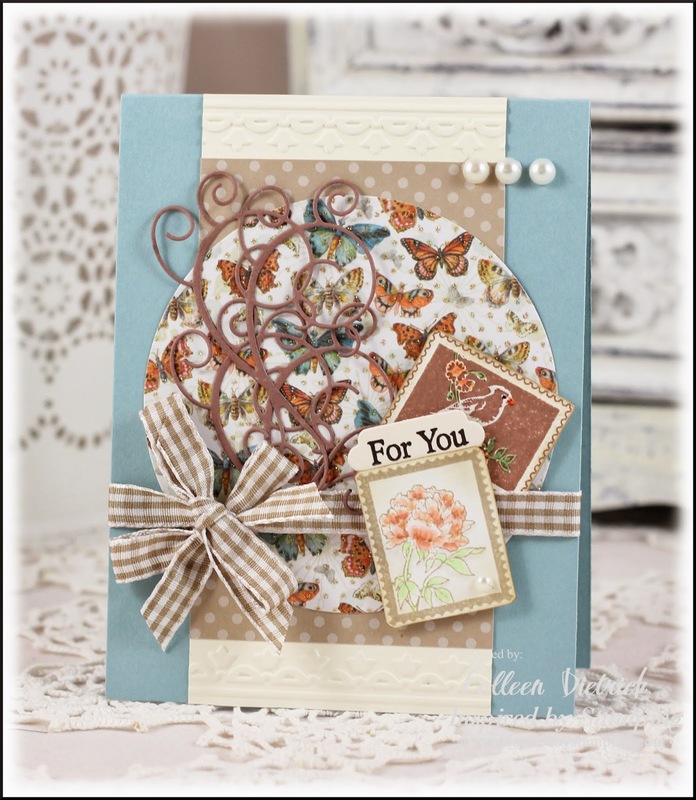 Pretty pretty cards Colleen! The first one is sticking, love the big hydrangea! A bevy of beauties, Colleen! That top hydrangea card is FABULOUS, Colleen!! Thanks for the gorgeous eye candy. These must be for sale at the gallery--great choices! And I hear ya on the laundry thing . . . Bits & Pieces Make For A HUGE Post!